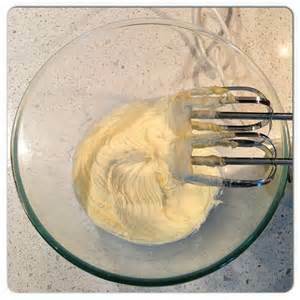 Creaming simply means mixing your butter and sugar together until they are well blended, leaving you with a fluffy, light yellow mixture. Here are 6 tips to make the process simple. Know why creaming butter is important. Creaming builds air pockets in cookie dough, which allows the cookie to rise. Air pockets in the cookie give it a lighter texture. 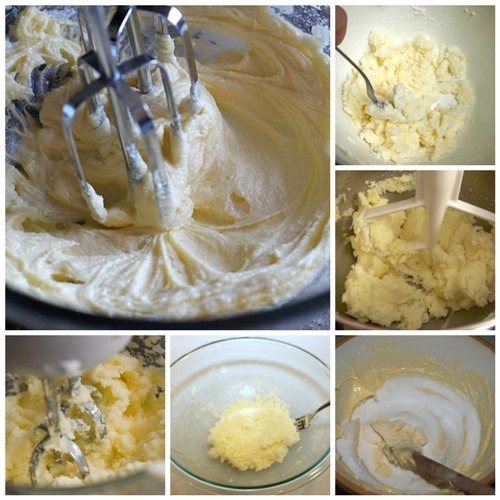 Set out the butter or margarine ahead of time so that it is easier to cream. Cream by hand with a spoon and a fork. Use the spoon to beat the butter in a circular motion until it is a smooth mass. Use the fork when you add the sugar to the butter. Press the tines into the mixture to combine the two ingredients together. Cream with an electric mixture by adding sugar gradually. You can use either a stand mixer or hand mixer. After butter is softened on low speed, switch to medium speed and add the sugar a bit at a time until the two are well-blended, about 5-7 minutes. Know what “well-blended” looks like. The mixture becomes lightened to a yellowish-white color and its surface forms tiny ridges or peaks. If you over cream butter and sugar, then the mixture separates. The texture becomes grainy and coarse. Separated butter and sugar means fewer air pockets. Cookies will be flat! Get full details for creaming butter and sugar together. Plus – be sure to check out The Elf’s Baking Tips Pinterest board for more helpful hints about baking cookies. You can prevent over-mixing butter and sugar three ways. Beat the butter by itself until it is soft and smooth.